Besan ladoo is an Indian traditional sweet loved by almost all generations. Its prepared with besan (gram flour), sugar and ghee. My granny prepares it every festive season especially during Ganesh Chaturthi and Diwali festival and ofcourse on her visits to our place, she never forgets to pack some for us. We never get this from sweet stalls, its always home made from my sweet granny. She visited us during summer vacation and she prepared this right in front of me in my kitchen for her grand-grandson. Every year, we visited granny for Ganesh Chaturthi, but this year we couldn't and i miss everyone and the festival goodies too. Ofcourse we get our share when my mom gets back but still I miss being around and helping others in decorating the mantap, pooja thali, rangoli etc. I prepared this Besan ladoo and it was my first attempt. I didn't have the ghee. Prepared home made desi ghee from the butter which I had prepared a couple of weeks before and then started off with ladoo preparation. That was double the work, preparing ghee ( clarified butter) and then ladoo's. Besan ladoo with microwave is my next mission and as far I know myself, I need some occassion or some other festive mood to drop in. Lets hope giving it a try coming Deepavali or Diwali. Ok. 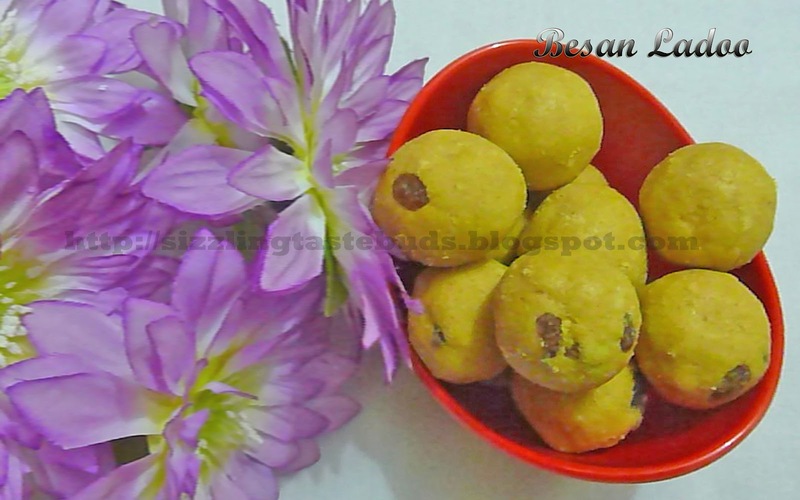 Lets head to our simple Besan ke Ladoo recipe. 1. Heat 1/2 cup ghee in a wide pan and add besan to it. Simmer the flame and stir continuously till besan gets roasted and you get a nice aroma and the raw smell goes. 2. Usually besan and sugar is 1:1 ratio. But you can adjust it according to your sweet tooth. Add in the powdered sugar and elachi powder and fry it for few more minutes again in a low flame. 3. Switch off the stove and remove the pan off the stove and allow it to cool for some time. 4. When the mixture is still warm, add dry fruits of your choice and start making ladoo's. If you find it difficult to make ladoo or feel the ghee is less, just melt some ghee and mix it with the prepared besan mixture. 5. Besan ladoo are ready to serve.